How often does Nancy’s Project deliver? Six days a week, 52 weeks a year. We take Christmas Day and New Year’s Day off. As Nancy liked to say, “People get hungry every day." Where does Nancy’s Project deliver? We deliver three days a week to three different sites in Salinas and three times a week to Greenfield. Our Greenfield helpers take donations to San Ardo and San Miguel. Are the groceries expired? No. The groceries have reached their "sell by" date but are still perfectly good. We distribute all food except pinto beans on the same day it is picked up from Safeway and Trader Joe’s. Do people have to demonstrate need? No. People line up for food and we distribute to all who come. Are there times of the year when needs increase? Yes. When there is little work in the fields (late fall through early spring). What types of donations are most welcome? How can I get my donations to Nancy’s Project? 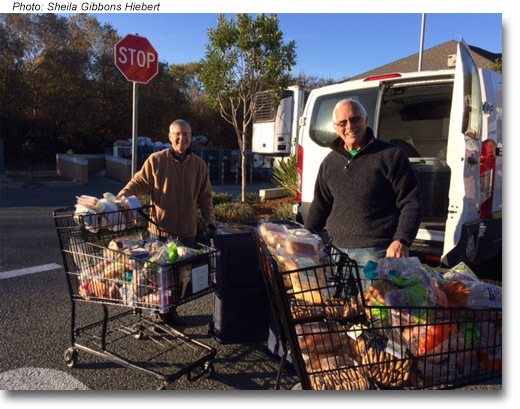 Call Nancy’s Project at 831-920-7737 for pickup or to get directions for a location where you can deliver them Tuesday-Friday, 9AM-1PM. Are there items you DON’T want/can’t use? We do not take king size beds, appliances that are not working or furniture and household items that are damaged or broken. Gently used items are fine. What special donation drives could my organization or friends do? We are always hoping for children’s and teens’ clothing and shoes, backpacks for school, hooded sweatshirts and sleeping bags. Some organizations also buy a load of pinto beans and rebag them into 4 pound sacks for our farm worker families. How much does it cost annually to run, store and maintain your delivery van? It costs about $13,500/year to maintain, store and run our van. Our total yearly budget is about $26,000. Do you accept cash donations? Yes, cash contributions are used for delivery expenses, pinto beans and occasional other items needed year round and for the Christmas Season. See Donations for details.